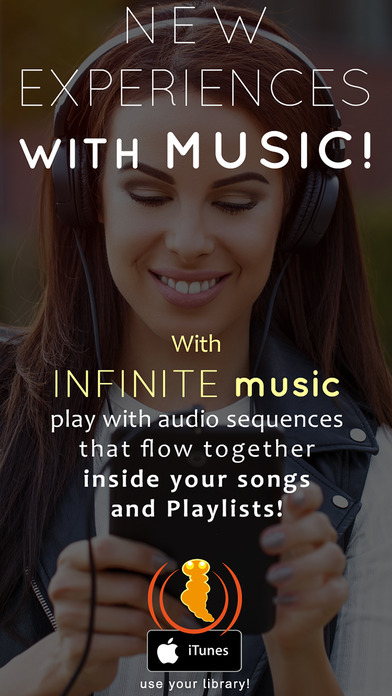 The idea of Infinite Music is to give you the ability to be your own DJ and mix your own music without having to purchase expensive DJ equipment, whether you are an aspiring musician or just a picky listener who wants to create the perfect soundtrack. 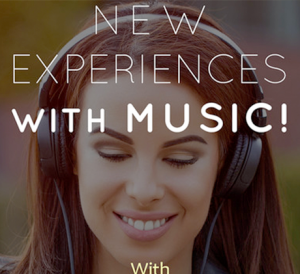 Like most music listening platforms your music can be separated by songs, albums, playlists, artists or genres. When you click a song to play, the app brings up the cover image for the song with a circle around it. 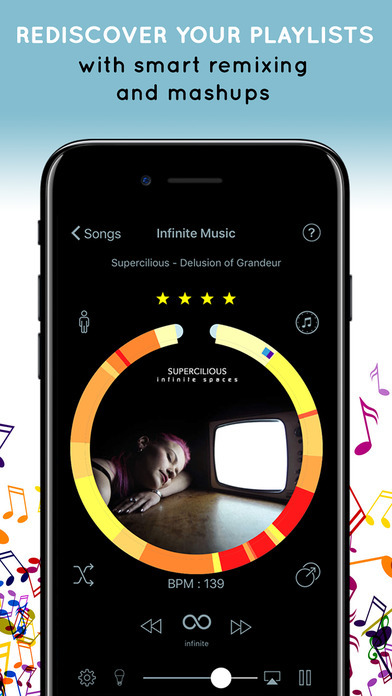 The circle displays information about the song that is playing, and where in the track you are, as well as the app telling you the beats per minute so that you can match songs with similar songs. There are two buttons on the top and bottom right hand side which let you control whether to have transitions on or off, and the period of time between songs. When you are compiling your playlists, you can either pick playlists that you make yourself from your library, or in one of my favourite features, the app can choose playlists that have similar tempos. This makes creating playlists that have consistent moods and feels incredibly easy, and the average Joe probably doesn’t have a DJ ear for picking out tempos out of songs. Not only this but when you are creating your transitions, the app can pick out an ideal song between the two songs for the smoothest possible transition. Not only that but the app can actually pick your playlist depending on what you are doing. If you are lazing around having a chilled-out day it will pick a playlist to match, and then if you went for a run the app would automatically change the music to suit that. This was one of my favourite features because it meant that, once you had your playlists all set up, you didn’t have to think at all about jumping between them during the day and you always had music that matched your activity. At first, I thought that this app was going to be very complex, but in reality, it is incredibly user friendly. If you need extra help the question mark at the top has loads of information to teach you how to mix songs and I haven’t seen any other apps out there so far that give you this kind of complex experience in a really easy to understand format. Not only that, but it’s free and you also won’t be served any pesky ads. The obvious comparison here is Spotify, where you can create playlists, however, the playlists in Spotify will always have gaps and not only that but unless you are willing to fork out for a premium membership, you will be fed ads every couple of songs that are un-skippable. Unfortunately, you will need to be on iOS 9.3 or higher to download this app but if you do have a suitable phone I would definitely recommend it. Whether you’re an aspiring DJ or musician, or you just want a fresh way to listen to some music that has been sitting in your phone for too long, this app is an incredibly easy way to see how the professionals mix their songs, and the fact that it’s free is just the cherry on top!